Calibrates and programs all analogue and digital tachographs. KTCO 1314/1318, Motometer EGK100, FTCO 1319, MTCO 1324/1390, TSU 1391, VR2400. DTCO 1381 (DTCO® 2.1 active), SE5000 (Exakt Duo), SmarTach, EFAS-4. Parameter programming including IMS (Independent Motion Signal) and VDO counter. Workshop card’s PIN recording and input through CD400. No power connection nor battery charging required, the only tester powered by the tachograph itself. 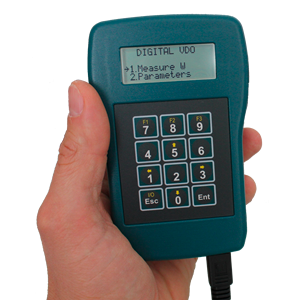 Compact size, the smallest tachograph tester on the market. User friendly, clear 4 lines menus, no training required. Automatic tachograph model detection on power on. Double accuracy of the W factor measure on track by detecting half pulses. The only tester being able to reset the odometer and change the sender type on the VR2400. Flash program memory, easy software upgrade using a serial port or USB serial adapter on any PC.